These twine with an old 30’s red climber in my garden. The two of them can always be counted on to bloom at Christmas. When I look out the windows in my kitchen I see these. Beyond them are huge liquid amber trees climbing into the sky. 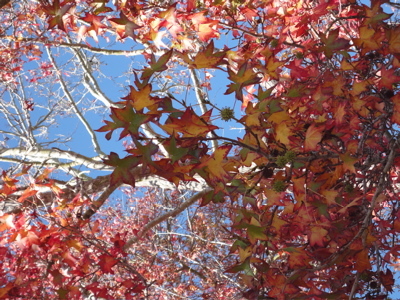 At this time of year their leaves are red and gold. The red rose has a quality that only really old roses have. The fragrance is dense and lush. Rare. For years I have thought to try and take a cutting off of it in case I ever moved, so I would never lose it. My grandmother had a formal rose garden in Pasadena. I have liked rambly climbers, myself. Because when they bloom they do this in a huge profusion. Especially the Cecile Bruner. For a long time I have wanted a larger garden. Mostly to just set it in place again. I haven’t worked much on this one in a long time because my heart isn’t in it. I have many books on gardening and I always go for the organic low maintenance style. Easier. I like a tumbly look in borders, too. The ideal is to set it up so that most things self-sow, because they do. The rains bring everything back. One of the things I love is the moss on old bricks, or the moss that grows in old garden pots. The Peace rose has a few variants, and a rather large back story. My generation wanted world peace in our lifetimes. We really did. We grew up believing in beautiful things like what the Peace rose stood for. If you click the link to the story above you can see how this rose was developed during WWII. In 1935, the French rose breeder, Francis Meilland, the third generation in a family of rose growers near Lyon, selected 50 ‘promising’ seedlings from his seedbeds. One was tagged 3 – 35 – 40 and over the next four years Francis and his father, Papa Meilland, watched its development with interest. In spite of war clouds gathering, the unnamed rose was introduced to friends and professional rose growers who gave it an enthusiastic ‘thumbs up’. But three months later Hitler invaded France and, with the nursery under threat of destruction, three parcels of budwood were hastily sent out of France, one of which was smuggled out in the diplomatic bag to America. For the duration of the war the Meilland family had no idea whether any of the budwood had survived. In America their agent planted the rose in his own trial beds and gave it to other rose growers for testing in all the climatic zones throughout the United States. 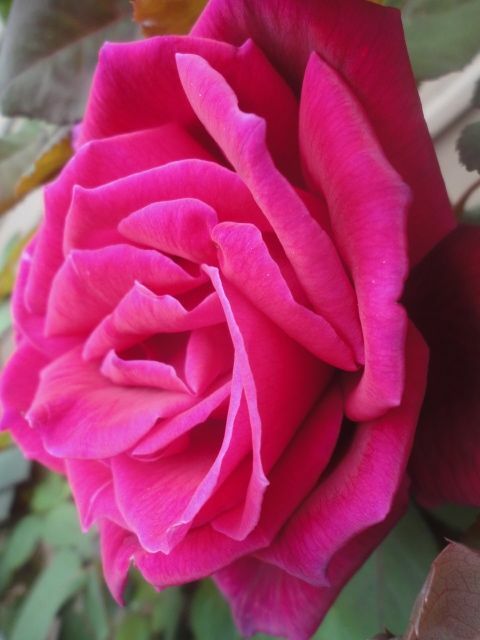 The rose did so well that it was decided to release it in the United States and thousands of plants were propagated. Although the war was still raging in Europe, the launch date was set for 29 April 1945, in Pasadena, California. Knowing my grandfather, he probably had one, as soon as it was developed. For my grandmother’s garden. He was just that way. The first roses I learned to grow came from Jackson Perkins. I sent for them when I was in college and I grew them in big planters on my little balcony. 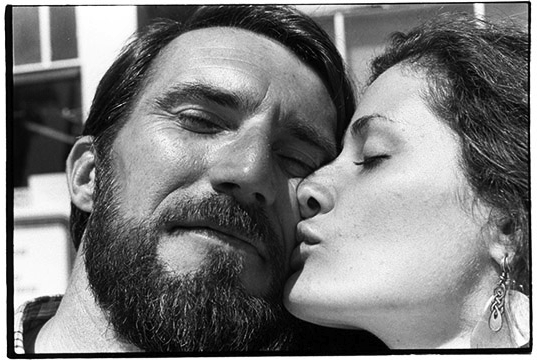 I had a lover that was a photographer in those days. The one I wrote about yesterday. Most of the time he was documenting bleak landscapes. When he came to see me, he always brought me a rose. I think he just grabbed them from his own garden, or he plucked them on his way. At the time I was stunned by that. As I am typing this, I have one of those Peace roses and two red ones in a glass next to me. The Peace is about eight inches in diameter. The scent is faint, almost fruity. 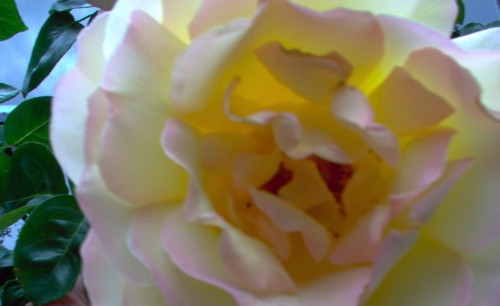 The petals are like the most delicate yellow silk brushed with faint pink at the edges. It’s a rose that glows from within. I know most of them by heart, because it is my favorite flower. The really old fashioned ones come from here. I only like the scent of rose in fresh roses, which is ironic in a way. But true. 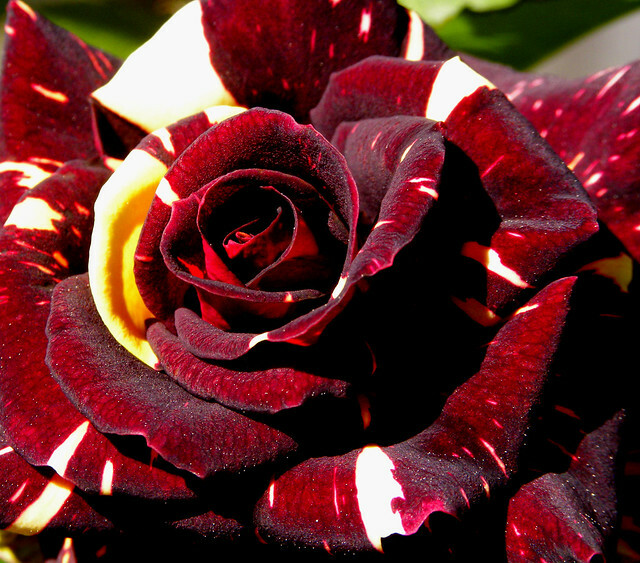 This one below is pretty beautiful, for a modern rose. The stripes remind me of boater hats and Renoir. Posted in beauty, Gardening. Tagged beautiful, Gardening, history of, old varieties, peace, Rose, roses. Next: Next post: Handmade Sweet Christmas ideas, to charm!